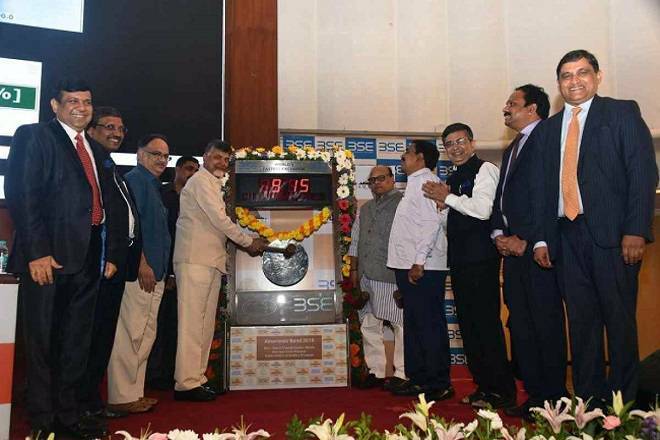 Being billed as the largest bond issued from a local authority, Amaravati Bond 2018, is meant to fund the building of the new state capital for Andhra Pradesh. The bond was listed on the Bombay Stock Exchange (BSE) on Monday. It is a 10-year issue, offered at a fixed interest rate of 10.32 per cent per annum, to be paid quarterly. The bond comes with a 5 year moratorium on principal payment, which can be redeemed on yearly basis for next 5 years at 20 per cent rate every year. The issue, worth Rs 2,000 crore, is guaranteed by the government of Andhra Pradesh and this has been emphasised in the note released by the state government and perhaps with a good reason. As the question arises about the available options for the state to repay the amount, which already has a debt to GSDP of 28.4 per cent (4 percentage points higher than the permitted limit). "We have concrete business plans by which, we can repay," says, Cherukuri Kutumba Rao, Vice Chairman, Andhra Pradesh State Planning Board. The interest payments in the first five years amount to Rs 208 crore per annum, as it works out to Rs 52 crore per quarter. The first five years, it will cost us Rs 1040 crore." "Effectively the full interest burden for the 10 year tenure is Rs 1,573 crore," he says. When asked about the revenue raising options, before the Andhra Pradesh Capital Region Development Authority (APCRDA), the agency for which the bond has been issued, he says, "There are existing municipal taxes which will be accruing to the APCRDA, plus there will be the user charges, development and layout clearance charges. The user charges of the infrastructure will also be there because there will be underground sewage treatment plants and power distribution network. There will also be monetisation of land (read: money from sale/auction of land) at times." He also adds that it is wrong to think that the state is among the most debt-ridden states in the country. "Look at the Centre, where the public debt is much higher," he says. According to Rao, the Rs 2 lakh crore debt of Andhra must be viewed in the context of the debt it inherited after the bifurcation of united Andhra Pradesh. "When the debt was distributed, 58 per cent was thrown on us and therefore we began with Rs 1,19,000 crore debt. In the last four years, we have borrowed only Rs 65,000 to Rs 67,000 crore and that is mostly for the interest repayment for the Rs 1,19,000 crore. In addition, there is undivided debt between Telangana and Andhra, which is now at Rs 23,000 crore and we are paying the interest on it. Add it all and it crosses Rs 2 lakh crore." The key concern, he says, is that the state is still largely an agricultural economy without much of service sector, as in other Southern states. He hopes things will turn around as industrialisation picks up in the state. For instance, the state has just become number one in terms of mobile phone manufacturing. But some economists feel the trend may have to be watched, since many of the new investments that the state has been attracting in manufacturing, have been after granting tax waivers and such other concessions. They think this may delay the gains from new revenues and taxes. Finally, it is not as if others have not looked at tapping resources for building a capital. The state of Chhattisgarh had approached HUDCO (Housing and Urban Development Corporation) for its new capital Naya Raipur. The Andhra government could take credit for tapping yet another route. But then, Amaravati bonds can also be viewed as a non-budgetary approach to raising money, which may be good as it does not attract the limits prescribed under the FRBM Act (Fiscal Responsibility and Budget Management Act). However, it could be a source of concern as it adds to the debt, because at the end of the day it is borrowing. Borrowings made in the budget have to be within the prescribed FRBM limit, which is 3 per cent of the GSDP, wherein the Reserve Bank of India issues the bonds and raises the money and passes it on to the state government. This is why questions are being raised about repayment and the new revenue raising options. There is also the point -- that funds raised through these bonds offer the flexibility to deploy funds to multiple works. The funds raised through the bonds route can be mobilised without any security and funds are not project linked, giving flexibility in financial planning to fund various ongoing capital city projects simultaneously. This may be good or bad, depending how you look at the fund utilisation, its monitoring and return.